AMRITSAR SAHIB—In a surprising move on May 26, the SGPC appointed Akal Takht Jathedar Giani Gurbachan Singh issued a statement against false indictment of NRI Sikh youths in various cases by the Punjab police. He has sought a neutral and independent probe into the claims of Punjab police about involvement of NRI Sikh youths in various murders of Hindu leaders. Citing the example of Gurjant Singh, a resident of Ludhiana, Giani Gurbachan Singh said that he was implicated in a false case by the NIA and Punjab Police. “Under the tutelage of the International Sikh Federation, Gurjant had objected to indecent songs in Punjabi and exposed elements targeting Gurmat ideology on social media but the NIA and Punjab police have falsely indicted him in five targeted killings in the state” he said. He has asked Punjab CM Captain Amarinder Singh to get his case investigated by a neutral agency. Giani Gurbachan Singh has directed the apex Sikh body SGPC, Sikh organisations and Sikh masses to come forward to provide justice to these Sikh youths. 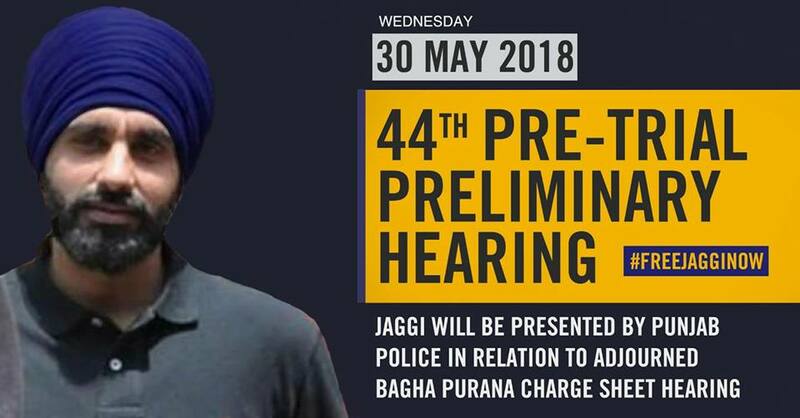 Tomorrow, Wednesday 30 May 2018 will see Jaggi being presented for his 44th Preliminary Pre-Trial Hearing. This Hearing was previously adjourned on 19th May to 30th May. Jaggi will be taken to Bagha Purana court by Punjab Police in relation to a chargesheet filed at the beginning of May in which Jaggi was named as an accused, despite there being no evidence against him.